Easy mashup time: Today we printed SimplusDesign's Wishbone Cookie Cutter Set on Thingiverse and Eckerput's Rolling Pin Spacer on Thingiverse so we can make some cookies! 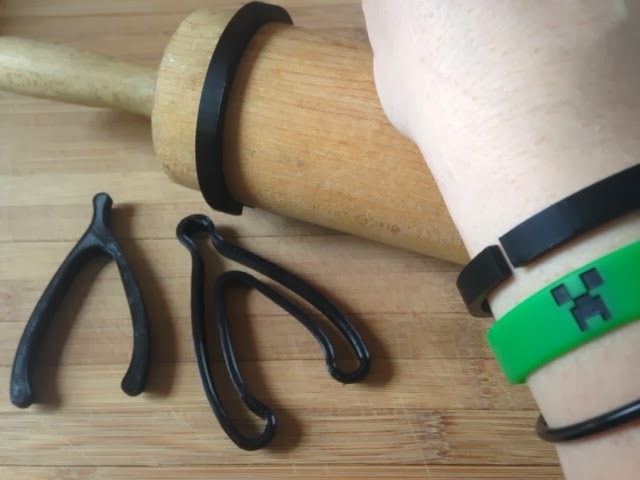 Also, a bonus: The rolling pin spacer can be resized into a really simple bracelet to use as a reward for winning the wishbone-breaking competitions that will ensue. Settings: MakerWare .3mm/low on a Replicator 2, with no raft and no support. The code is probably fairly self-explanatory except for the "difference" command. This command works by creating the first object that is listed and then subtracting all objects listed after that. In this case, Eckerput is making a solid cylinder that it is 7 mm high and whose radius is enough to get around the rolling pin and make room for the desired thickness of dough. The "$fn" part tells OpenSCAD to use 200 fragments to make the round part of the cylinder; this controls how smooth the cylinder will be. Using a value as high as $fn=200 can slow your code down significantly in more complicated examples, so when working with rough code I suggest using $fn=12 or not including any $fn directives. There are two things that have to be removed from the cylinder that was created on the first line of the difference command: first, the center of the cylinder, to allow room inside for your rolling pin; second, a small slit in the resulting annulus to give the ring some flexibility to enclose and grip the rolling pin. Note that in each of these objects to be removed, Eckerput made the height 14 instead of 7; this is so that those objects extend well past the original cylinder and do not share any faces with the original cylinder. Failing to do this can cause strange errors in OpenSCAD. For more information on how to get started with OpenSCAD, see the OpenSCAD User Manual.